In the Backyard: A festive laugh at my expense. A festive laugh at my expense. I could never be accused of being a Scrooge. The month of December is without a doubt my favorite time of year. I annoyed my husband with multiple repetitions of the "PLEEEEEEASE can we put up our Christmas tree now?" question until he finally relented the weekend before Thanksgiving. The Advent season touches my spirit deeply, gift-giving completely delights me, and I could happily watch Elf on repeat from now until the 25th. I hum carols and wear out holiday playlists and get all misty at every rendition of "Greensleeves" ever recorded. Christmas music thrills me. I cannot stand "The Christmas Song". "Tiny Tots with their eyes all aglow..."
All of you normal people are scratching your heads in confusion, as you try to discern just what it is about the picture of sweet, excited children basking in Yuletide revelry that I find so objectionable. Well, see, my mind does not play that lovely scene when I hear that line. No. What do I see? 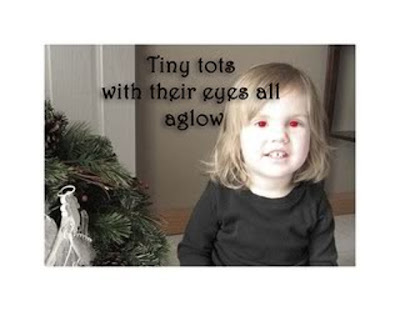 Creepy, alien children with red glowing eyes. A whole posse of them. Staring at me. This image does not enhance the turkey and mistletoe and Eskimo-dressed folks that comprise the rest of the tale. (And the fact that they're going to "find it hard to sleep tonight" frankly makes me think, UM...ME TOO.) 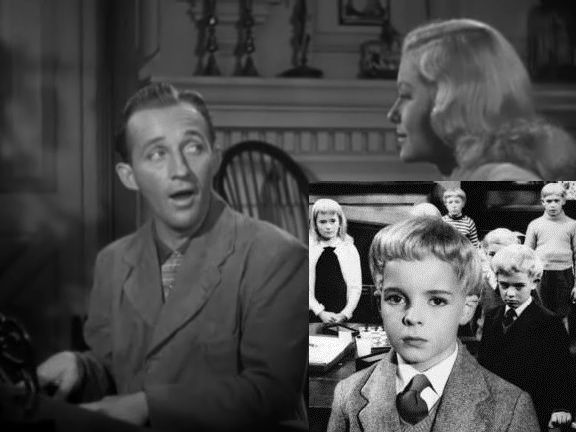 It's like sticking the freaky kid from any given horror movie next to Bing Crosby at the piano; Bing crooning "White Christmas" in his beautiful baritone, while the child just stares. And stares. Anyway, a few years back, a discussion was taking place on our online Mama board (the one where Megan and I met and became friends) about our favorite Christmas songs of all time. I decided to bare my soul in the safety of this circle of friends and reveal my freako issues with a beloved classic song for the first time (other than to my husband, who frankly finds the whole thing quite amusing and loves nothing more than to CRANK up that particular portion of the song if he can find it on the radio while we're in the car.) Needless to say, my lovely friends were very tickled by the admission, and took much amusement from my attempts to persuade them of the creepiness of the song lyric. It was all fun and merriment and Fa la la la la. She struck. You know, our dear friend Megan? Sweet-as-can-be, more loving and kind-hearted than seems humanly possible but just really IS possible with her...the one I'm writing a book with and call my mind twin and count among my very favorite people ever...THAT Megan? Aaaaaaand cue therapy. Or at least shrieking, which I did as soon as I saw this, and the shuddering which commences every year as my precious Common Ground ladies have made it an annual tradition as soon as we've all had our fill of Thanksgiving turkey, to dust off this picture and post it anew in order to kick off the Christmas season with uproarious laughter. They mean it with love - as did Megan. But I ask you...am I the only one that has ever interpreted "The Christmas Song" to be more frightening than festive? If so, you can tell me. Or lie to me. I'm good with that too.